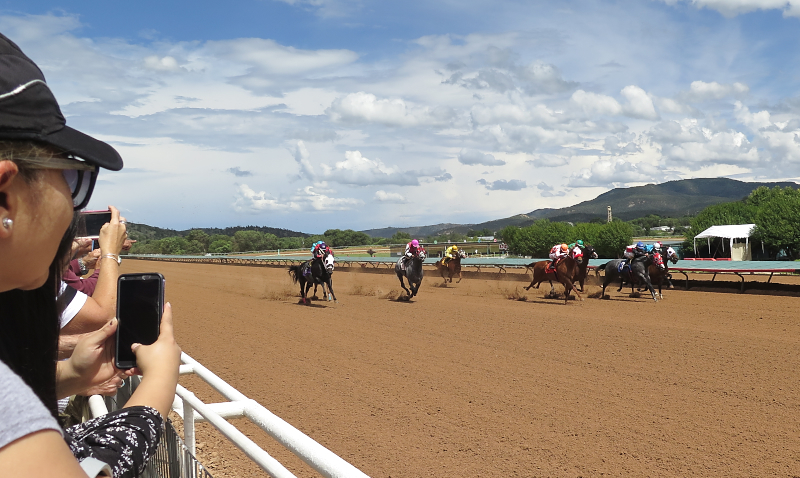 Ruidoso Downs is a charming racecourse located in the Sierra Blanca Mountains of southern New Mexico, at an elevation of about 6900 ft MSL. It is named after Ruidoso (ree-do'-so, to use the Spanish pronunciation), a nearby town of about 8000 population, named in turn after Rio Ruidoso (noisy river), a small but aptly-named creek that runs rapidly through the town in a narrow rocky bed. 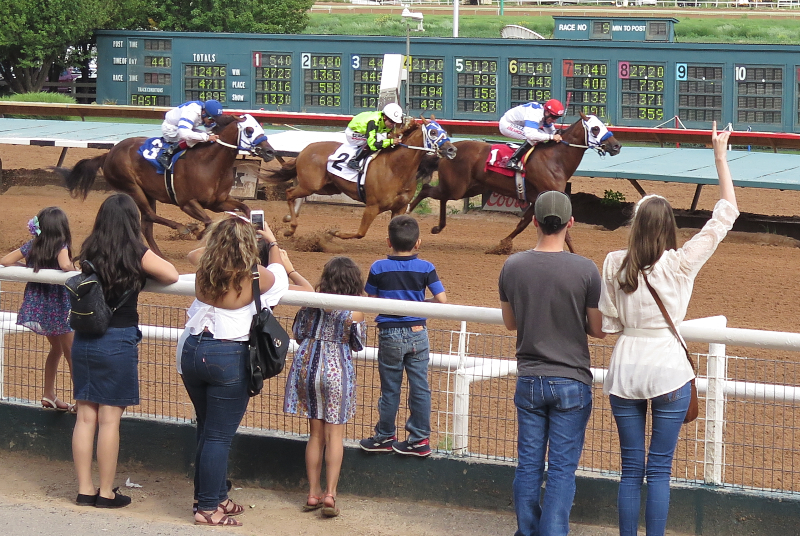 Both thoroughbred and quarter horse races are run at Ruidoso Downs. Quarter horses are horses bred for great speed over short distances, for example one-quarter mile, hence the name. The breed is derived from the working horses used in the western U.S.
At Ruidoso Downs, on a given day's program there will be both thoroughbred and quarter horse races, and often (as today) a "mixed" race, in which both thoroughbreds and quarter horses compete, running on the oval at distances of often about one-half mile. 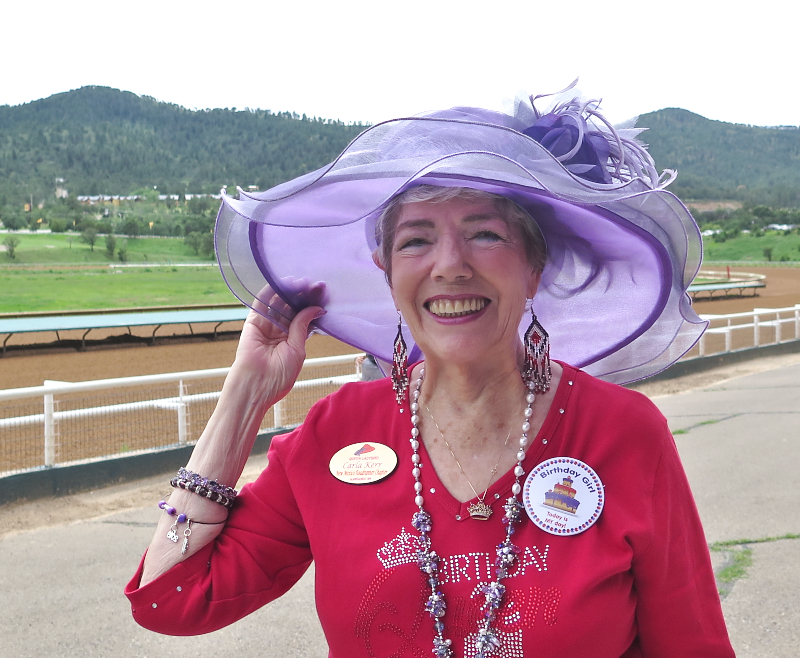 The track is about a one hour drive from Alamogordo, and is a popular site for adventures of Carla's chapter of The Red Hat Society (one held just today, as a matter of fact). The 2 horse is about 2/3 length over the finish line. As you can see from the exposure metadata, the track benefited from New Mexico's legendary sunshine (this was already at 4:40 pm MDT). Its not only at Ascot or Churchill Downs that we see fine ladies in fabulous hats. This was Carla's first outing with the chapter since her birthday, so it became a celebration of that. So full of life. This was a wonderful outing!